Update, 12.40, 27 Jan: strike suspended! By way of contradiction to the below post, the strike has now been suspended after the RMT announced that the threat of this action had secured all their goals in the negotiation. From the good DLR news to the not so good. This Wednesday and Thursday (28 and 29 January 2015) there’s likely to be no service at all on the DLR network, as staff strike in a dispute about their terms and conditions under their new employer. The DLR is operated by a private company, with services, fares etc. set by TfL (much like the Overground is). On 7 December 2014 that operator switched from Serco to Kelios Amey Docklands. (N.B. Another of Kelios’s joint ventures, this time with Go-Ahead, may be familiar to you: it’s called Govia and it operates Southeastern, Southern and Thameslink.) Serco had operated the DLR since 1997, and had been hitting record highs of reliability in recent years, so their loss of this contract was quite a surprise, and surely based on the bottom line rather than any concerns about performance. So says the RMT statement last week calling the strike action. And it seems most workers agree, with 96% of those voting in the strike ballot voting to take strike action (and 97% voting for other action short of a strike too). These are figures perhaps closer to typical DLR reliability stats than to typical ballot results, so it seems safe to assume a high proportion of DLR staff will not be at work during the strike period. It’s therefore unsurprising that TfL have today said that if the strike goes ahead, it’s likely there’ll be no DLR services at all between 4am on Wednesday and 3.59am on Friday – in other words, all day on Wednesday and Thursday this week. Their advice to avoid the busiest times to travel if possible seems a little superfluous – I’m not sure anyone travels at the busiest times if they don’t have to. Good luck to anyone who’d normally travel by DLR looking to find an alternative route on Wednesday and Thursday; and good luck to RMT members in standing up for their conditions, too. Just for once, here’s a bit of caveat-free good transport news for Lewisham! I look forward to greatly increased chances of a wait for the DLR of less than four minutes after I arrive home by train from an evening out – the critical point at which it’s quicker to catch it than walk home (although of course I wouldn’t need to if the Platform 4 gate were open…)! Anyone else trying to relate developments seen on the Lewisham Gateway site to the original 27-month plan will also have noticed that things have not been exactly sticking to that plan, as it stood a year ago. That last point is the key to what’s about to happen, which is the first major divergence from the previous plan. This time next week, part of the new Rennell Street road surface will be open to vehicles (and, on its south side, pedestrians), as part of a year-long triangular expansion of the Lewisham roundabout, prior to its removal early next year. The ‘triangleabout’, as I non-succinctly named this interim arrangement when I saw it in the original plan, is being put in place about eight months earlier than originally planned, and this configuration will last about twice as long as originally intended, too. This particular triangleabout arrangement is not quite the same as any of the variants in the original plans. This arrangement was originally going to kick in after Molesworth Street’s new stretch alongside the railway line from Platform 2 had been built, and traffic heading from Rennell Street past Glass Mill would have used this to exit the triangle. Instead, it’s only a very small section of the roundabout that’s being taken out of use – just the bit between Molesworth Street and Lewisham High Street. Traffic which would currently drive west along the south side of the roundabout will instead have to circle the whole building site between there and Rennell Street – formerly the location of a small car park and the mound on which most Save Lewisham Hospital marches began. That’ll surely take some getting used to for road users, and essentially amounts to the removal of a roundabout but the installation of a gyratory system in its place. if we assume there’s a size and shape limit on roundabouts! But what about pedestrians? It’s not great news for us, either. Because the triangleabout is being treated in just the same way as the current roundabout, that means no pedestrian access to it, nor any of its edges. 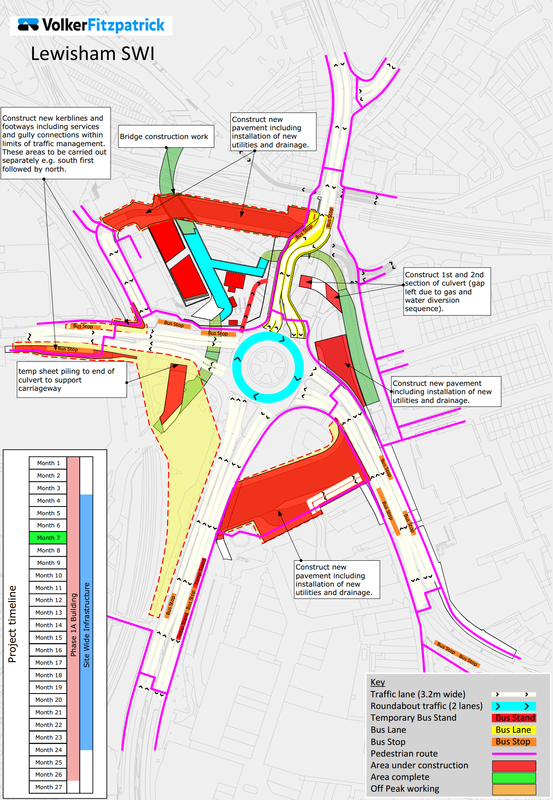 The only place to cross the stretch of Lewisham High Street between the roundabout and clock tower will be the crossing by the shopping centre entrance – the crossing nearer the roundabout will be gone, because one side of it will be on the new triangleabout. From the map it appears there’s a bit of a catch on Lewisham Road, too – if you head along the main road to the crossing that used to link Station Road to the now-removed little semicircular park, you won’t be able to carry on on that side of the road towards the petrol station/Londis; only to cross the road and head for the station or Maggie’s. If you want to walk to Granville Park or Londis, you’ll need to fork off by the police station up the hidden stretch of Lewisham High Street behind where that park used to be, on the other side of the river Quaggy. The pedestrian crossing by Glass Mill will finally move west of the railway line as part of this arrangement, so overall it appears pedestrian routes around the roundabout will actually become longer – who’d’ve thought this was possible?! The one possible silver lining, which I’m hoping isn’t just drawing simplification on the map, is that it appears the crossings may be full-width across the roads, so halving the number of separate waits to walk between DLR and town centre compared with now. This may just be wishful thinking based on a simplified drawing, but there’s a distinct shortage of silver linings for pedestrians in 2015 otherwise. The original 27-month plan involved a great deal of evolution of the road layout over the duration of the work, so my guess is that they’ve settled on making this one big change as early as possible with a view to keeping things far more stable for a longer period than previously planned, in order to avoid repeated confusion as layouts for both road users and pedestrians changed on a more frequent basis. It also means the end of the roundabout in its current form is now just six days away, suddenly making this objective very obvious and public. And if these tricky pedestrian links persist for a whole year, the vast improvement of the final arrangements will certainly be even more warmly welcomed when they arrive in 2016. It’s all change on the bus stop front now too, as stop F (outside Glass Mill) reopens, stop A (northbound station stop for 180/199/273/380/N89) is being rebuilt on the temporarily diverted bit of Lewisham Road, and stop P (by the clocktower) is closing for a while, with its buses instead serving the very crowded stop E opposite the police station. The next meeting of Lewisham Central Assembly will be held on Saturday 24 January 2015 at 12 noon at Hither Green Baptist Church on Theodore Road. The agenda has been published on Lewisham Council’s site and includes a presentation and Q&A on this new ‘pop-up’ housing proposal for the former Ladywell Leisure Centre site (looks beautiful! ), as well as a funding vote and updates on various issues including SE13URE favourite Lewisham Gateway. I intend to go and livetweet proceedings, so will publish my tweets on SE13URE afterwards too. (Last time’s tweets are here.) If you live, work or study in Lewisham Central ward [PDF map], come along! Running just to the north of my central Lewisham patch, Darryl today reports on the sudden, unexpected and roadworks-attributed cutback of bus route 53 from Trafalgar Square to Lambeth North, starting tomorrow. But that’s not the only cut sprung on us via the publicity medium of the scrolling bottom row of iBus displays in the past day or two. Yesterday I noticed on a 47 I’d caught iBus said the route would only run as far as Liverpool Street station, not Shoreditch, also from tomorrow (17 January 2015). No explanation of why, and at that point there was no information to be found about this anywhere online at all – including in TfL’s bus service changes PDF, which hasn’t been updated since 10 December! 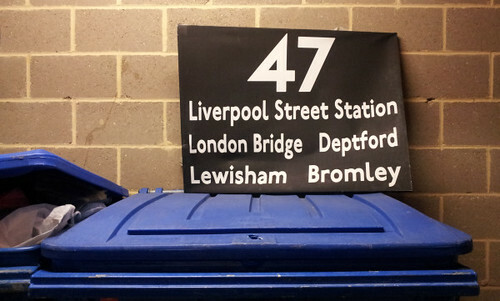 The new 47 service harks back to the era represented on this canvas I found in my block of flats’ bin room some time ago – but without the Bromley end! I tweeted at @TfLBusAlerts, from where the ever-helpful Craig revealed it was (like the 53’s cut) due to roadworks. I’ll be in Shoreditch on Monday evening and will be interested to see if these look noticeably worse than they’ve been for months – and, if not, what’s changed to warrant depriving SE Londoners of a direct link to Shoreditch as part of what appears to be something of a network-wide service-reduction approach to coping with disruption, starting tomorrow. I am writing to let you know that from Saturday 17 January until further notice, route 47 in the City of London area, will stop short of its normal destination. This is due to major road works being undertaken on behalf of a number of utility companies, who are carrying out upgrades and essential repair works. Rather briefer and simpler than the e-mail about the 53, which sounds like it’ll run its full route at certain times – no such luck for 47 passengers. The worst aspect of the 47 change is the complete lack of suggestion of an end-date to the inconvenience. It feels worryingly like an attempt to change this route near-permanently without the hassle of consultations, expense of publicity and need to provide proper justification. Let’s hope the end does come eventually. As mentioned recently, there’s a London-wide bus strike today at 18 of the companies that operate London’s red buses for Transport for London. Unlike most strikes, it’s relatively easy for anyone to gauge how effective this one is being at cutting back London’s bus service today because of the Countdown platform that TfL uses to tell you (and allow others’ apps to tell you) when your next bus will be along. I’ve been through London Vehicle Finder (LVF) to check how each route that normally operates through Lewisham town centre is running today. I did this research at lunchtime but LVF also gives you a history of the route back to midnight on the day you search. My research found that nine of Lewisham’s 23 routes have had no buses operating on them all day since the early hours when the strike kicked in – well done to the union members for observing the strike so collectively! In all it seems only approximately 21% of the bus vehicles that would normally serve Lewisham town centre have been doing so today. Only one Lewisham route, number 75, currently appears to be operating with 100% of its bus fleet on the road. This is a strange anomaly for services based at a bus garage (Catford) where so many other routes have been completely off the road, and I’d be interested in anyone’s thoughts on why this has happened with this one route alone! My full findings are below in a table. Note that PVR stands for Peak Vehicle Requirement, meaning the number of bus vehicles needed in total to operate the route at its most vehicle-intensive period. This may well not be weekday lunchtime so you can take the percentages quoted as ‘worst-case’ ones – maybe there were more buses out in the peaks when the full PVR-sized fleet should have been… maybe. Source: live bus info from London Vehicle Finder, 13.30, 13 Jan 2015. PVR data from London Bus Routes. Other nearby routes affected include the 453, on which just three Boris vanity buses (PVR 35) are operating at time of writing, and the 53, which has six out of 26 buses in service. Someone over at BBC London has done similar research across all of London and also at lunchtime reports that 30% of London buses were running, with 330 routes not running, 630 routes affected in some way and just 44 routes not affected at all (including presumably the legendary B12, and B13, B15 and 160, run by Arriva Kent Thameside where there’s no strike today). 22 routes had just one bus each running on them. So there’s no doubt this has been a major strike across London and hit the most-used form of transport in the city very hard – congratulations to those organising such an ambitious co-ordinated strike. Next we’ll see whether there’s any movement from the 18 companies involved on the issue of whether to negotiate towards a shared set of terms and conditions for bus drivers across the capital. And in the meantime, enjoy – for want of a better word – the strange sight of Lewisham town centre with only a fifth the usual number of buses in it!